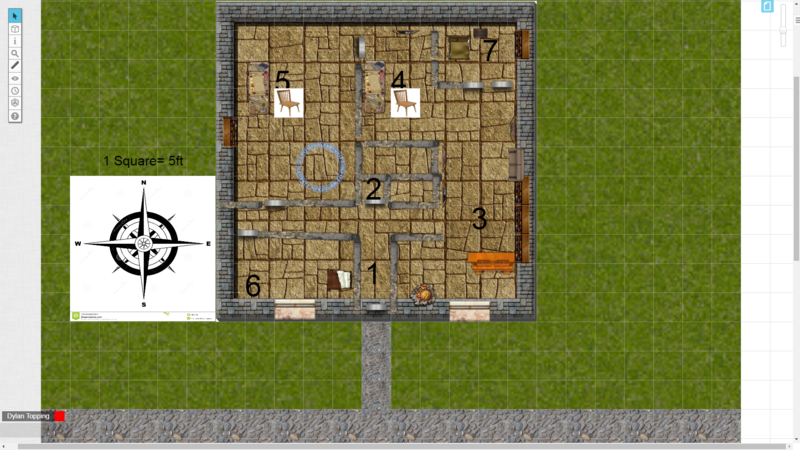 Constructed a little over fifty years ago in the small town of Amber, this small, two-person bungalow was sold a little over a year ago to the ageing half-orc wizard, Aquor Von Canto and his roomate, the elven cleric, Pepehel. Now with Aquor lying dead inside the master bedroom, this humble house has become infected with wild magic. The building itself was small, and mostly made of stone, including the magically reinforced inner walls. Two windows adorn the front of the house, muted against the utter blandness of it all. No decorations, nore gardens adorn this clearly frugal building. Inside, the building was equally as spartan with a narrow entranceway (1) flanked only by a small mat for wiping one’s boots, as well as an empty window frame containing the cooking pot in the kitchen, allowing smells to make their way across and assault those just entering into the building. The far left of the building was almost entirely dominated by a magical study; (5) it’s main feature: a summoning circle upon the ground, it’s magic slowly fading due to the death of it’s master. Opposite this room, and across the main hallway again was Pepehel’s bedroom (6), a collection of rags and religious iconography, with clothing haphazardly thrown about, covering the vast majority of the floor in a scene reminiscent of a students dorm. Finally, in the opposite corner of the building, past a pair of entirely unnecessary double doors, was the second bedroom. (7) Relatively modest, the room was also sparsely decorated. Upon the bed itself was the body of its occupant, surprisingly fresh, given its age, with a large metal poleaxe driven through the body’s abdomen, pinning the body to the bed itself. Congratulations, Dylan. Putting yourself out there to compete in anything is hard, and designing RPGs is hard. Particularly designing adventure settings or locations. You have to be able to suggest some ideas about personalities, plots, terrain, and more, and have GMs chomping at the bit to add your location to their regular game. Let's see how you did! I believe in positive feedback and honest criticism that should make you better at every part of this gig. So to start positively, I want to say that you start us off with two important things in your entry: drama and character. I get a quaint little house with aging friends, and a few hints into their intimate relationship. I can hear Pepehel saying "it took him years to get it right", as if he or she's imagining the trial and error nature of Aquor's invention. Now, there's a lot of opportunity for improvement here. I don't know Pepehel's race or gender or the nature of the two's relationship. Why not make them a longstanding intimate couple and add a bit of sweetness to the drama? That increases the sadness of Aquor's passing. We're not romance writers for sure, but emotion is immersion so take every chance to address relationships and motivation. Background information aside, there are a few things I'd like to see from you if you advance. You struggle with spelling, grammar, and run-on sentences. Submitted work should be a better overall draft and easier to read and comprehend. You switch tenses. Write in active present tense and eliminate most past tense and almost all passive language. That will make you a much better, faster first-draft writer. I'm not fond of the parenthetical numbers in paragraphs, preferring individual paragraphs to describe individual rooms. You could benefit from a review of some Pathfinder mechanics and conventions. Magic schools aren't usually capitalized, and summoning circles or spell effects don't fade if their caster dies. Now for the hard one: there's no adventuring here. An adventure location should be more than a small house with a dead body. I think you're trying to describe a regular cottage and then end us with a bit of mystery teaser. But if this were published, it doesn't include anything about Aquor's enemies, who the corpse belongs to, where the adventure should take us, etc. If I were running a game, I am more likely to make use of the cottage map and completely insert my own adventure. I would have recommended a larger scale adventure location with flora, fauna, personalities, conflicts, and natural hazards. A place I want to move an adventure to. Adventure locations are about immersion and exciting potential. I think the next chance you have to submit to an open call you'll show improvement if you remember those things, and write a few drafts before submitting. Thanks for participating and good luck in voting! This adventure location presents a mystery in Aquor’s death and the consequences of that mystery. PCs might be interested in discovering who murdered Aquor or stopping the release of wild magic. Beyond that, though, there’s not a lot to work with. You could have described the effects of the wild magic, or added a contraption invented by Aquor that acts as a trap (tying into his inability to get things right). The wild magic could have activated the summoning circle to call forth a fiend of some description. The map is clean and conveys the cottage very well. You made sure it included rooms one would expect in a residence. I think you could have added a few more bits of dressing to make the map feel more whole, but that is a quibble, and I imagine a cartographer would have had no problem filling in the blanks. The location’s description tells the reader where all the rooms are, but the numbering breaks up the text, and isn’t consistent. I understand the need to make it clear which room is which, but it would have been best to have an index on the map itself. The use of past tense in your description makes it seem like the various features are no longer in the cottage. You definitely want to use present tense and avoid passive voice. There are also a few instances where you use “it’s” rather than “its.” In short, this would have benefitted from a proofreading pass (either done yourself or by a trusted friend). Overall, this adventure location presents a potentially interesting mystery and the threat of wild magic, but it doesn’t do much else to make this a compelling location for adventurers. Therefore, I can't recommend this to advance. Living residences -- by which I mean ones that are still in daily use as a home (which this was until apparently just recently) -- can make tricky dungeons. It often doesn't make sense for there to be traps or many of the other elements we expect when we send PCs into "dungeons." At first glance, it looks like this entry is going to avoid that problem by infusing the house with "wild magic," but then there's no evidence of that in the rest of the write-up. As is, we have a humble house but there's not much to be done there. There's a murder mystery set up, but there's nothing exciting about the location itself. Mike and Steve have noted some of the grammar/verb tense issues, but I'd also point out that the writing itself downplays the excitement -- it actually calls out the location's "utter blandness." It's hard for me to get excited about that. Similarly it calls out a pair of double doors as "entirely unnecessary" -- so why are they there then? I'm not sure if the idea was to juxtapose wild magic strangeness or a horrific murder against the otherwise mundane location, but if so, I don't think that was the best choice for a contest where voters need to be wowed. As for the map, I like that the areas in the home are different shapes (especially Room 3 leading into Room 4) and several areas have enough room for combat should a fight break out here. That said, the overall structure is a simple square -- which is very rare to find in architecture. There's plenty of space on the map to make the home a bit bigger and have a few areas jutting out beyond the central structure. Even if the idea was to keep it tightly constrained, perhaps it has a well or some sort of outbuilding. Again, I think the choice of making this such a subdued location hurts as there is less room to play around with the map. Perhaps one of the inhabitants was a gardener, which could have added a visual element -- perhaps a summoning circle design in the foliage -- while still allowing for the home to be a small cottage. One more small note: I don't know that the mapping program was the best choice in this case; I have to really look closely to differentiate the doors from the walls and I think that would make for a little more work for the graphic artist who would use this turnover to make the final map product.